Thanks to a friend and some Arabian desert magic, I got to work on a trio of pieces that combined three of my loves: Fashion, food and going out in Dubai. We asked three chefs to look at designers participating in the recent Vogue Fashion Dubai Experience and each choose a look that they could be inspired by in their cooking. The resulting gourmet creations were incredible, truly mouth watering and the pieces I got to write, after meeting the chefs and visiting their venues, a delight to work on. All around, what I like to call a win/win. Check out all three blogs, starting with this one. Of course, the full piece you can always find on The Huffington Post, my home for all things great. When American movie star Chris Pine called Dubai the “Future-land” during a press conference earlier this year, I finally found within his observation the perfect way of describing a feeling I’ve had for some time now. Whenever I’m in Dubai, this marvelous city of possibilities, I feel like I used to feel in N.Y.C., in my early days there. Because Dubai — like the Manhattan of Julian Schnabel and Jean-Michel Basquiat — is a land of visionaries and pioneers, but also a megalopolis that is achieving its stellar place on the jet setting world map at dizzying speeds. No other place does is better, bigger and faster. And nowhere is this more apparent than in its Downtown district. If you want a five-star plus luxury hotel, that is where to book. If you want the latest designers clothing, you step into The Dubai Mall. If you want to eat at world class restaurants, savoring dishes created by Michelin star chefs, this is where you book your table. The choices are endless and the possibilities, limitless. Even when you think you’ve done it all in Dubai, there will be a new restaurant opening up, a trendy designer will install their flagship store here, or you’ll discover that a world-class celebrity chef has moved to the city from Paris, London or New York City. Recently, everything I love in life — fashion, food, glamour and fun — came together in one place, under one roof I already adore, The Dubai Mall, in this hotbed of activity and excitement. The end of October saw the second edition of the Vogue Fashion Dubai Experience taking place in the fashion capital of the Middle East and I kick myself for having missed it. But with the help of a few friends in the right places and the willingness of three master chefs to step outside their comfort zone, I managed to find a way to celebrate glamour and gourmet, in my own very special way. 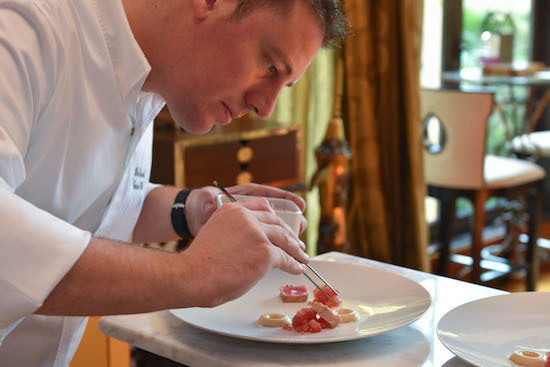 Chef Steve Deconinck, Executive Chef of The Palace Downtown DubaiAt The Palace Downtown Dubai, I found in the figure of their Executive Chef Steve Deconinck a magnificently inventive soul. Of course, the hotel itself had me at “hello”, from the moment I stepped into their Arabian-inspired lobby, complete with central water fountain and the fragrance of exotic flowers in the air. And I can’t wait to go back for some spa treatments and another Palace cappuccino, which came complete with 24-carat gold leaf and four scrumptious, perfectly chilled macarons. But I digress, which is easy to do when surrounded by the understated grandeur of the place. This entry was posted on Saturday, December 5th, 2015 at 4:53 am and is filed under Food, Interviews, Man's Opinion, Style Icons, Woman About Town.